Forever fabulous, forever fringe: An essential element in every Boho girl’s life, be it on her newest handwoven wall hanging or her prized vintage suede bag. Our favorite version, clearly, would involve gold and diamonds. Inspired by a the magic of a dream catcher, and a hint of vintage charm, our latest fringe earrings are certain to become the most coveted addition to your Sofia Kaman jewelry collection. The perfect diamond earrings for someone who loves a tiny bit of drama and lot of sparkle, this antique-inspired pair would also make a stellar component in a bohemian bride’s accoutrement. 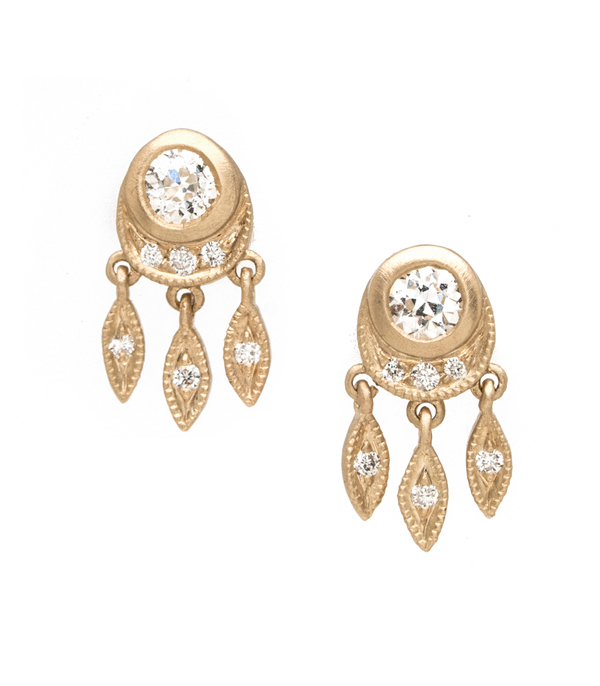 Cast in a matte 14K gold, set with Old European cut diamond centers, framed with tiny pave set diamond crescents, and finished with dangling diamond-studded marquise drops, these adorable earrings are hand crafted in Los Angeles by our artisan jewelers. Categories: Alethea, Bohemian Elegance, Earrings, Modern Bohemian.